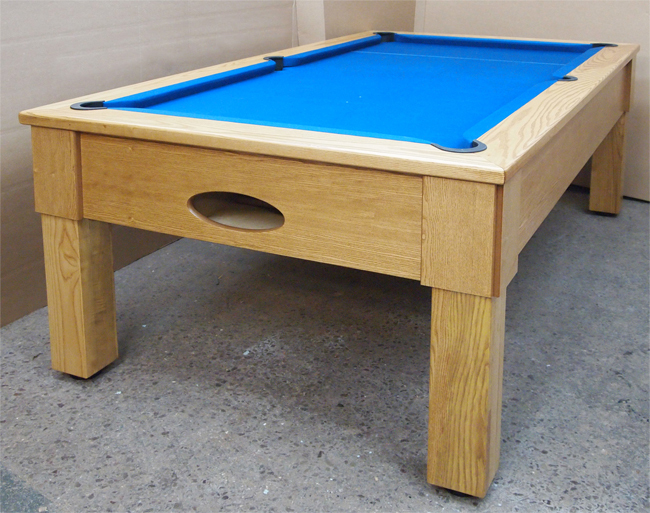 Square leg pool Table in Oak or Ash. The Artisan made Windsor Free play Pool Table maintains excellent playing conditions on a genuine Italian slate bed whilst retaining the style and great looks for your home environment. Northern cushion rubbers give excellent ball response. Both cushions and bed covered in Hainsworth wool napped cloth for technical play beyond the standard. Manufactured by skilled ex Riley fitters in Accrington by Sovereign Snooker, comes supplied with cross rest, 2 quality pool cues and a set of industry standard pool balls. Hainsworth Smart wool napped cloth with a colour of your choice. Legs and Cushion surround in solid Oak or Ash with matching Veneered side panels. Precision Ground 1 piece 3/4" Italian Slate bed. The 6ft table would give you a playing area of 66.5" x 32" and overall external size of 75" x 44.5" with a recommended room size of 14 x 11 feet. The 7ft table would give you a playing area of 72" x 38" and overall external size of 84" x 48" with a recommended room size of 15 x 11.5 feet. recommended room size of 17 x 13 feet. A two piece matching harwood veneered table top can be made for £125 if required. We deal direct from the factory and don't have a showroom, this is reflected quite a lot in our prices. However you are welcome to visit the workshop and see production for yourself. Just call or email using the details below. If your room is under development, we understand that building works seldom go to plan and will hold the table until you are ready to take delivery. We are not a high volume manufacturer with most of our tables made to our customers special instructions. ( we do things the old way ) To place an order a 20% deposit is required either by cheque or bank transfer. The balance paid in cash or bank transfer at point of installation and your satisfaction. Lead time usually 4 - 5 weeks. Please see our "Customer testimonials page for reassurance"
7ft windsor Pool Table £1595, deposit @ 20% = £319 Balance of £1276 in cash at point of install. All our tables are fully hand built from the very best materials available and manufactured in Accrington, Lancashire by ex Riley employees. This is one of the few manufactures left in this country that has such a wealth of real skilled labour and delivers such fine craftsmanship and quality of service.